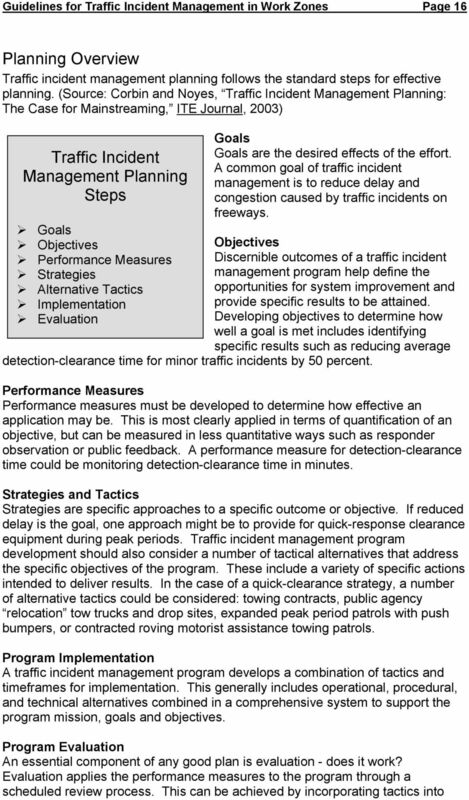 Download "Guidelines for Developing Traffic Incident Management Plans for Work Zones"
5 Guidelines for Traffic Incident Management in Work Zones Page 3 I. 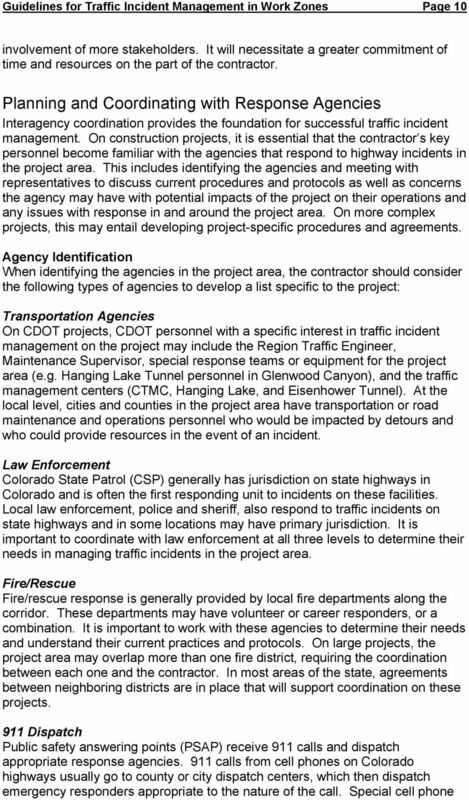 Introduction Goals of Traffic Incident Management for Work Zones The Colorado Department of Transportation is committed to providing a safe and reliable transportation system. According the Federal Highway Administration (FHWA), nearly 800 fatalities and 37,000 serious injuries occur annually from vehicle accidents in work zones The number of persons killed in motor vehicle crashes in work zones [went] from 789 in 1995 to 868 in 1999, with an average of 768 fatalities a year. 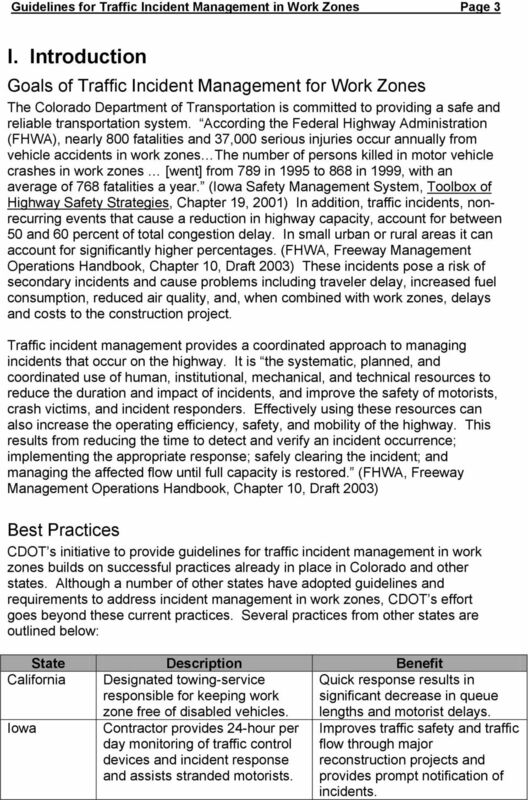 (Iowa Safety Management System, Toolbox of Highway Safety Strategies, Chapter 19, 2001) In addition, traffic incidents, nonrecurring events that cause a reduction in highway capacity, account for between 50 and 60 percent of total congestion delay. In small urban or rural areas it can account for significantly higher percentages. (FHWA, Freeway Management Operations Handbook, Chapter 10, Draft 2003) These incidents pose a risk of secondary incidents and cause problems including traveler delay, increased fuel consumption, reduced air quality, and, when combined with work zones, delays and costs to the construction project. Traffic incident management provides a coordinated approach to managing incidents that occur on the highway. It is the systematic, planned, and coordinated use of human, institutional, mechanical, and technical resources to reduce the duration and impact of incidents, and improve the safety of motorists, crash victims, and incident responders. Effectively using these resources can also increase the operating efficiency, safety, and mobility of the highway. This results from reducing the time to detect and verify an incident occurrence; implementing the appropriate response; safely clearing the incident; and managing the affected flow until full capacity is restored. 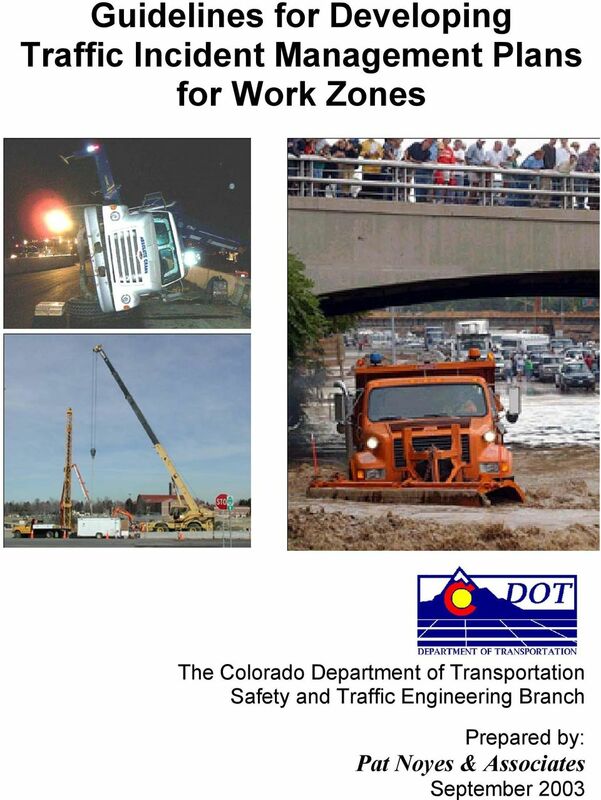 (FHWA, Freeway Management Operations Handbook, Chapter 10, Draft 2003) Best Practices CDOT s initiative to provide guidelines for traffic incident management in work zones builds on successful practices already in place in Colorado and other states. Although a number of other states have adopted guidelines and requirements to address incident management in work zones, CDOT s effort goes beyond these current practices. 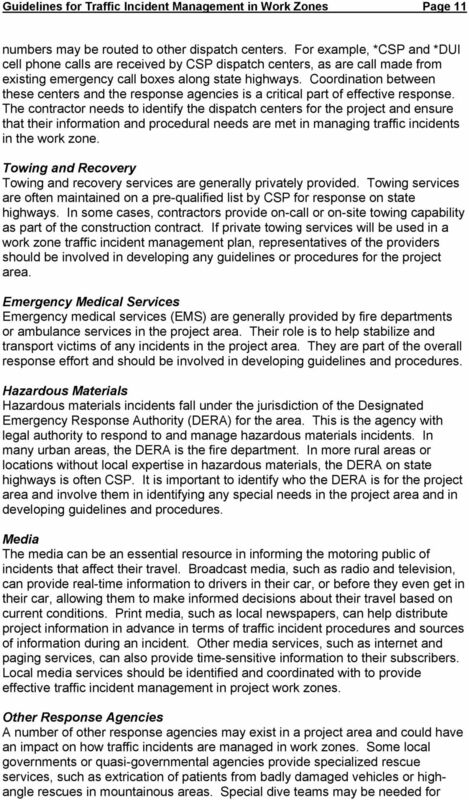 Several practices from other states are outlined below: State Description Benefit California Designated towing-service responsible for keeping work zone free of disabled vehicles. Iowa Contractor provides 24-hour per day monitoring of traffic control devices and incident response and assists stranded motorists. Quick response results in significant decrease in queue lengths and motorist delays. Improves traffic safety and traffic flow through major reconstruction projects and provides prompt notification of incidents. 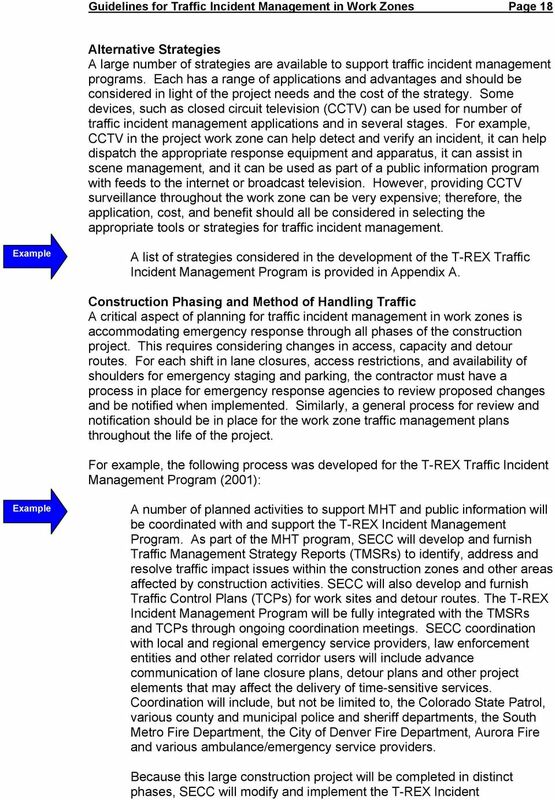 7 Guidelines for Traffic Incident Management in Work Zones Page 5 Examples of formalized traffic incident management programs developed for long-term reconstruction efforts include the Big I Project in Albuquerque, New Mexico and the T-REX project in Denver. Both projects provided a program that integrated transportation and public safety agencies in planning and responding to incidents in the work zone. They also provided coordination through a dedicated traffic operations center that monitored and coordinated response to incidents. The T-REX program is outlined in more detail below. 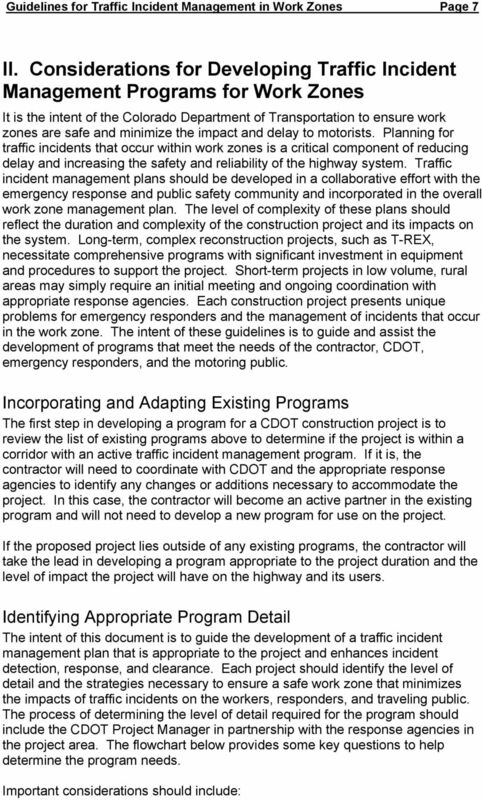 Overview of Existing CDOT Traffic Incident Management Programs The Colorado Department of Transportation (CDOT) has led the development of a number of traffic incident management plans and programs throughout the state. These programs address procedural and coordination aspects of managing unplanned events on the highway that impact the flow of traffic. These incidents range from environmental events to stalled vehicles to multi-vehicle crashes to hazardous materials incidents that may impact the shoulder or close the entire highway. 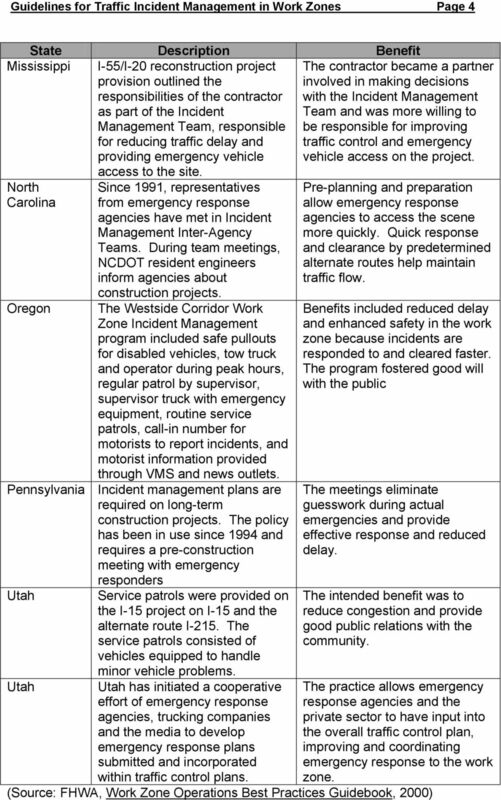 Currently, there are nine active traffic incident management programs for Colorado Interstates and State Highways. Below is a brief description of these programs. Additional information for each program is available in the program response manual and the final report. North I-25 Weld/Larimer Counties The North I-25 Weld/Larimer Counties Incident Management Plan developed by CDOT Region 4 in 1996 was the first of its kind in the state of Colorado. The limits of this plan are I-25 from SH 7 (MP 229) to Exit 293. US 36 I-25 to Boulder The US 36 Incident Management Plan covers the Boulder Turnpike from I-25 to Boulder. 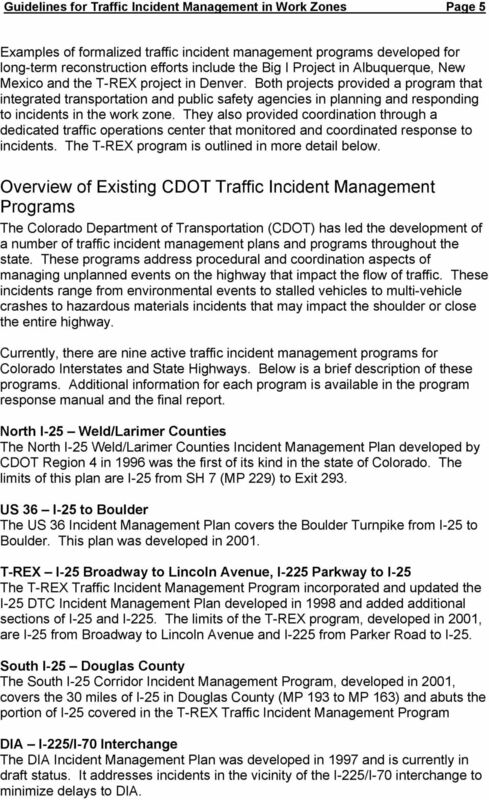 This plan was developed in T-REX I-25 Broadway to Lincoln Avenue, I-225 Parkway to I-25 The T-REX Traffic Incident Management Program incorporated and updated the I-25 DTC Incident Management Plan developed in 1998 and added additional sections of I-25 and I-225. The limits of the T-REX program, developed in 2001, are I-25 from Broadway to Lincoln Avenue and I-225 from Parker Road to I-25. South I-25 Douglas County The South I-25 Corridor Incident Management Program, developed in 2001, covers the 30 miles of I-25 in Douglas County (MP 193 to MP 163) and abuts the portion of I-25 covered in the T-REX Traffic Incident Management Program DIA I-225/I-70 Interchange The DIA Incident Management Plan was developed in 1997 and is currently in draft status. It addresses incidents in the vicinity of the I-225/I-70 interchange to minimize delays to DIA. 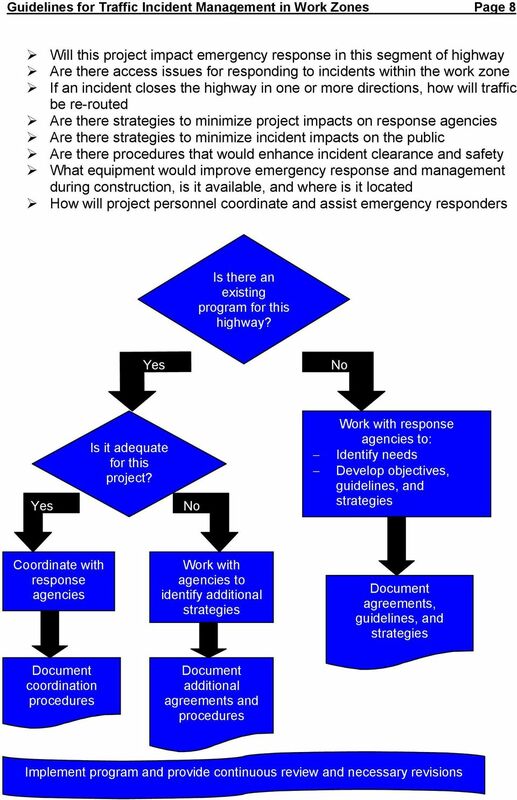 8 Guidelines for Traffic Incident Management in Work Zones Page 6 6 th Avenue Kalamath to I-70 The US 6 Kalamath to I-70 Incident Management Program was developed in 2001 and covers 6 th Avenue from Kalamath east of I-25 to I-70 in Jefferson County. I-70 Mountain Corridor Morrison to Utah The I-70 Mountain Corridor Incident Management Program covers 259 miles of I- 70 through the mountains from the Utah state line to the Morrison exit. The program coordinates across two CDOT regions, Region 1 and Region 3, and between three traffic operations centers, Hanging Lake Tunnel, Eisenhower Tunnel and the Colorado Transportation Management Center in Lakewood. 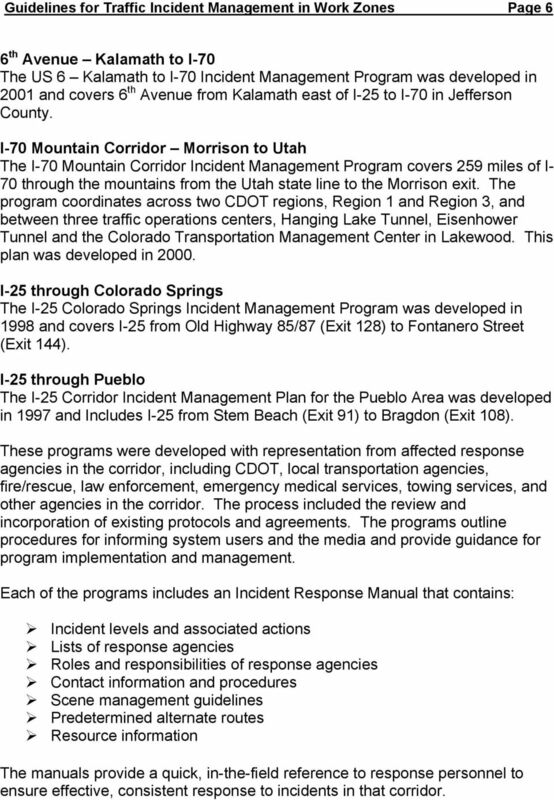 This plan was developed in I-25 through Colorado Springs The I-25 Colorado Springs Incident Management Program was developed in 1998 and covers I-25 from Old Highway 85/87 (Exit 128) to Fontanero Street (Exit 144). I-25 through Pueblo The I-25 Corridor Incident Management Plan for the Pueblo Area was developed in 1997 and Includes I-25 from Stem Beach (Exit 91) to Bragdon (Exit 108). These programs were developed with representation from affected response agencies in the corridor, including CDOT, local transportation agencies, fire/rescue, law enforcement, emergency medical services, towing services, and other agencies in the corridor. The process included the review and incorporation of existing protocols and agreements. The programs outline procedures for informing system users and the media and provide guidance for program implementation and management. Each of the programs includes an Incident Response Manual that contains: Incident levels and associated actions Lists of response agencies Roles and responsibilities of response agencies Contact information and procedures Scene management guidelines Predetermined alternate routes Resource information The manuals provide a quick, in-the-field reference to response personnel to ensure effective, consistent response to incidents in that corridor. 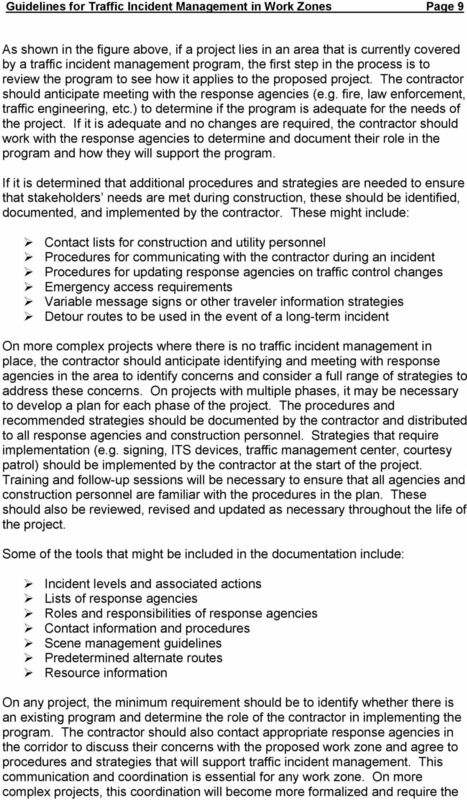 15 Guidelines for Traffic Incident Management in Work Zones Page 13 support incident management during construction. For example, if the project includes a permanent variable message sign and it is possible to construct it and bring it on-line early in the project, it can be used to inform drivers during incidents or delays in the work zone. In addition to permanent installations, there are a number of strategies that use ITS devices in temporary or portable applications. These include trailers that combine surveillance capabilities with VMS displays, or VMS boards mounted on the back of a truck that can be located quickly to support incident management. These are fairly inexpensive strategies that provide significant benefit in terms of safety and congestion management. 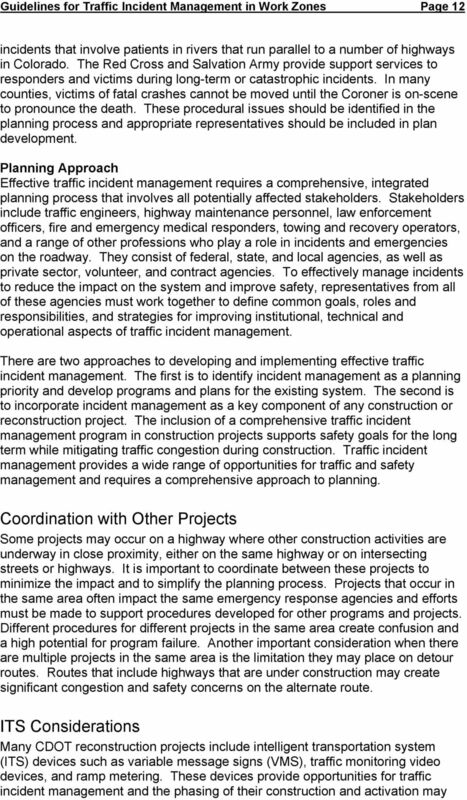 16 Guidelines for Traffic Incident Management in Work Zones Page 14 III. The Planning Process Traffic incident management programs address several key components or phases of traffic incident management, including: Incident Detection and Verification Incident Response Incident Site Management Incident Clearance Motorist Information Dissemination Many of the goals and strategies for traffic incident management target specific phases. Incident detection and verification begins as soon as an incident is discovered and reported. Verification may occur with the arrival of the first responding unit or by use of video surveillance equipment. The important aspect of verification is that it helps substantiate the incident and begin defining the resources needed and the level of impact to the highway. Incident response encompasses all responding agencies. It is the process of providing resources necessary to address life-safety issues as well as manage the traffic and subsequent clearance. 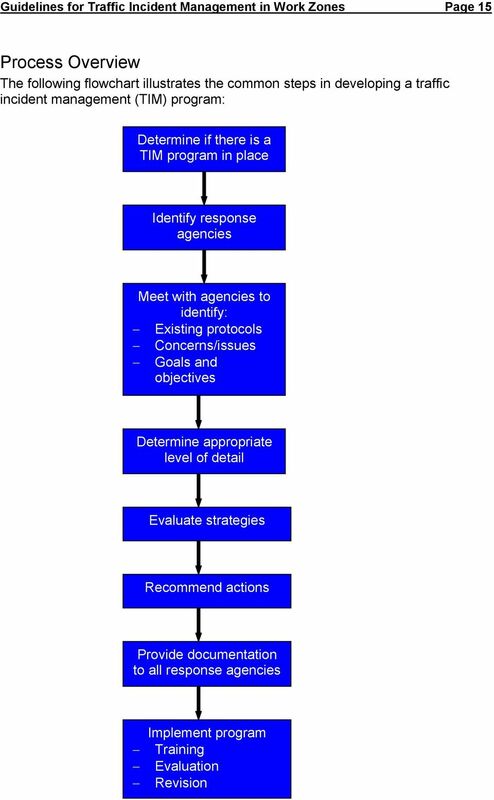 A well-planned and managed response minimizes the number of units and ensures the appropriate resources are allocated efficiently and effectively. Effective site management ensures a scene that is safe for responders, victims, and other motorists. It is well coordinated and orchestrated to minimize impacts to response agencies and the public. Incident clearance is the process of clearing the incident from the roadway and returning the traffic to normal conditions. In the event of a long-term incident with significant impact on the capacity of the highway, this may include rerouting traffic around the scene until capacity is restored and incident-related congestion reduced. A very powerful component of traffic incident management is traveler information. Motorists who are informed of an incident and can use that information to make changes to their travel plans are less frustrated and less likely to become caught in the resulting delay. This is important from a customer service perspective as well as from a scene safety perspective. Reducing the number of frustrated drivers caught in the congestion reduces the potential for secondary crashes and the exposure of on-scene workers and responders. 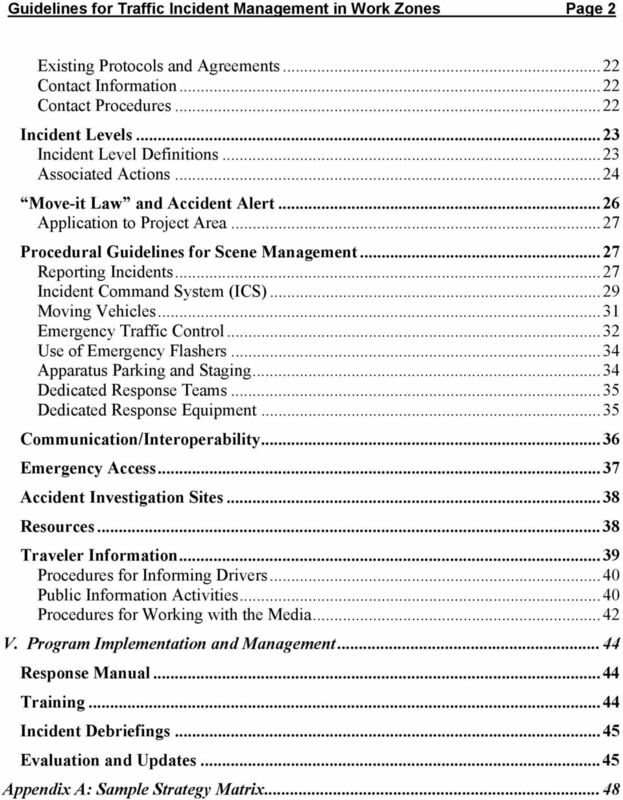 19 Guidelines for Traffic Incident Management in Work Zones Page 17 regularly scheduled evaluations, collecting before and after data on specific objectives, and building performance monitoring into service contracts. Multi-disciplinary Approach Successful traffic incident management programs depend on strong, interagency involvement and commitment. The nature of these incidents requires a high level of collaboration and coordination to meet the safety and mobility needs of all affected parties. All agencies responding to incidents must be involved in program planning to ensure that the program meets their needs and will be implemented in a coordinated partnership. A planning process should be developed that involves representatives from transportation agencies, emergency response agencies, private sector interests and the media. 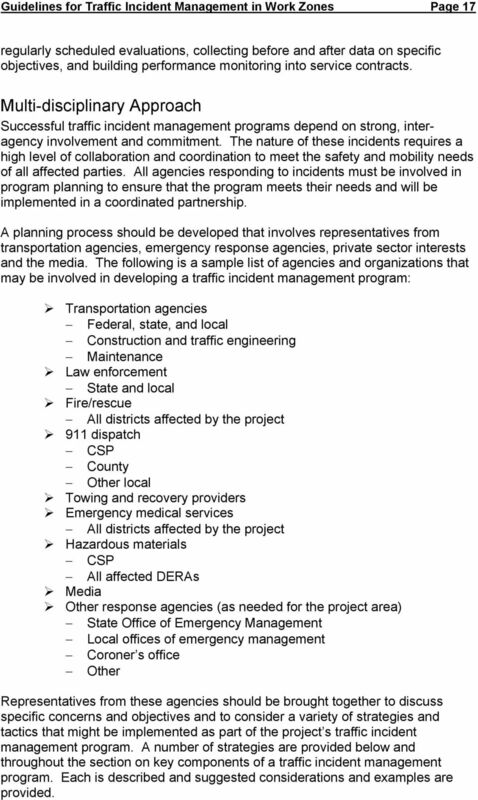 The following is a sample list of agencies and organizations that may be involved in developing a traffic incident management program: Transportation agencies Federal, state, and local Construction and traffic engineering Maintenance Law enforcement State and local Fire/rescue All districts affected by the project 911 dispatch CSP County Other local Towing and recovery providers Emergency medical services All districts affected by the project Hazardous materials CSP All affected DERAs Media Other response agencies (as needed for the project area) State Office of Emergency Management Local offices of emergency management Coroner s office Other Representatives from these agencies should be brought together to discuss specific concerns and objectives and to consider a variety of strategies and tactics that might be implemented as part of the project s traffic incident management program. 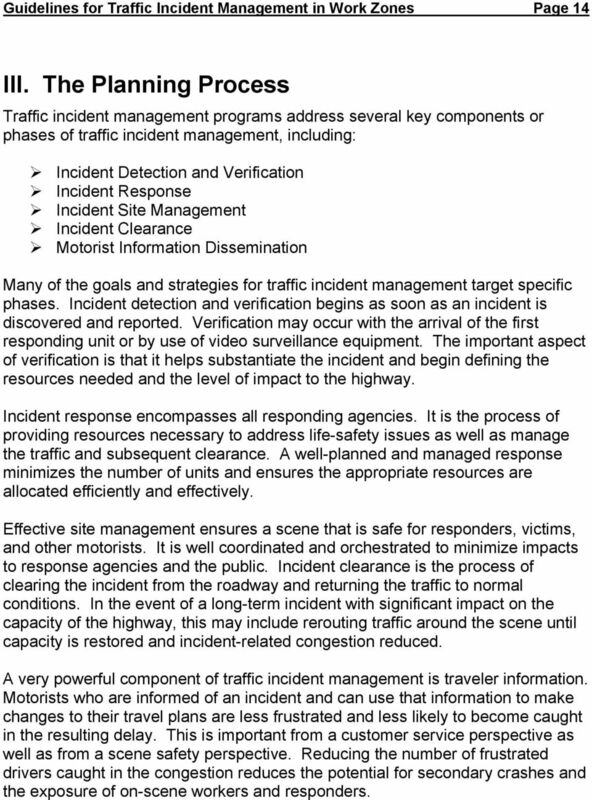 A number of strategies are provided below and throughout the section on key components of a traffic incident management program. Each is described and suggested considerations and examples are provided. 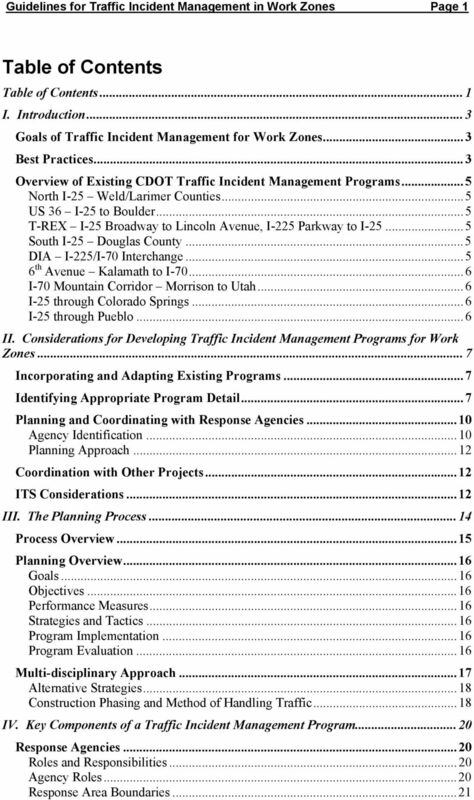 21 Guidelines for Traffic Incident Management in Work Zones Page 19 Management Program in conjunction with the planned construction phases. The T-REX Incident Management Program will be updated prior to the start of a new construction phase to accommodate actual and projected changes in the Corridor. STANDARD OPERATING PROCEDURES. Rapidly establish triage, treatment and transportation of multiple field casualties.